Los Angeles Sparks forward Nneka Ogwumike has been named the 2016 WNBA Most Valuable Player presented by Samsung, the league announced. The fifth-year forward earned her first MVP award and became the eighth different player in the last eight years to win the honor. 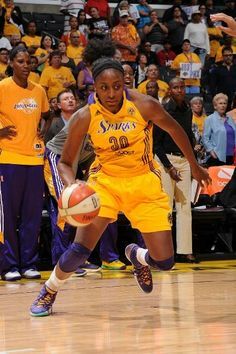 She is the third winner for the Sparks, joining teammate Candace Parker (2008, 2013) and Lisa Leslie (2001, 2004, 2006). Ogwumike (362 points) received 31 of 39 first-place votes from a national panel of sportswriters and broadcasters. Tina Charles of the New York Liberty received the other eight first-place votes and finished second with 267 points, followed by Maya Moore of the Minnesota Lynx (197 points), Elena Delle Donne of the Chicago Sky (119 points) and Parker (30 points). Players were awarded 10 points for a first-place vote, seven points for a second-place vote, five points for a third-place vote, three points for a fourth-place vote and one point for a fifth-place vote. Behind Ogwumike, Los Angeles went 26-8 and earned the No. 2 seed in the 2016 WNBA Playoffs presented by Verizon. The Sparks won their first 11 games, the second-longest winning streak to open a season in WNBA history, and their 20-1 record through 21 games equaled the best one-loss start ever.